If your students are like ours, when they pick up a highlighter to underscore what is important in the text they are reading, they highlight just about everything. We might as well give them the information copied on yellow, pink, or orange paper. Part of the problem is they don’t “clean read” first to understand the context for the content. They just highlight away to the point of distraction. 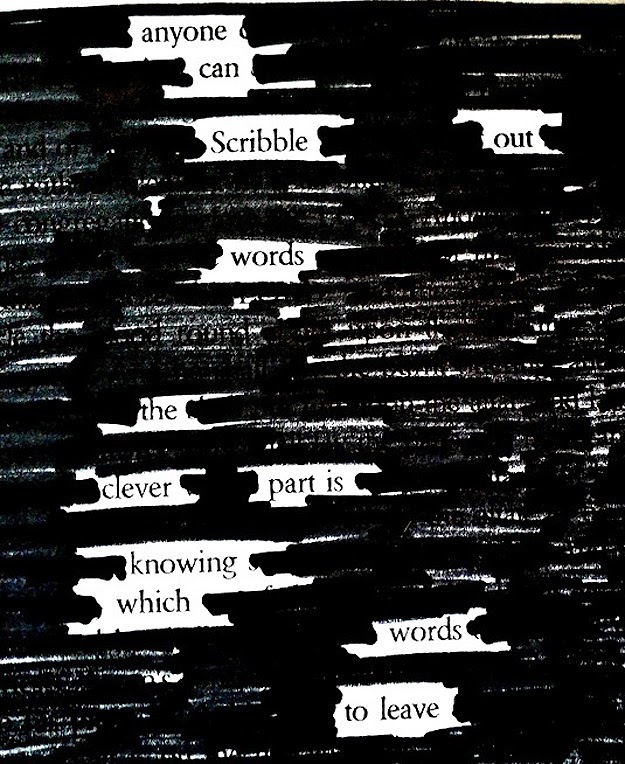 The concept of finding select phrases to support the topic does not even occur to them. This exacerbates the problem, leading to paper or electronic notes covered in color. Everything becomes important. They fail to select the main idea and miss supportive evidence for it. 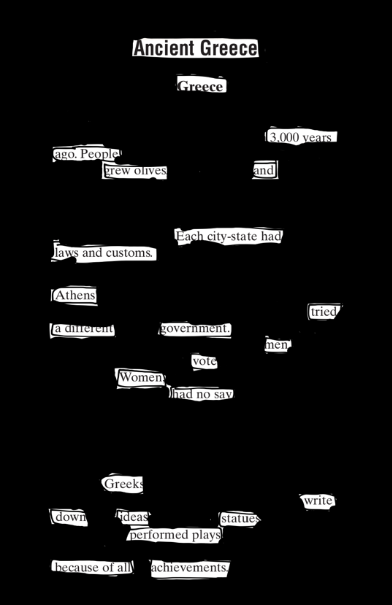 Recently, we started to experiment with the blackout technique that is often used in creating poetry from newspapers and other texts, and we banned highlighting. To our surprise, the blackout process had additional benefits that we did not consider at first. In their search for the perfect word choice, students needed to reread the content for the finished product to make sense. In other words, they had to stick with the text. This method alone opened up opportunities for them to think about the information. It was anything but random in selecting the right words or phrases to make their nonfiction poem work. The process was simple. The students download a PDF from our website and opened it using the app Notability on their iPads. This allowed them to carefully revise selected content, proofread for continuity, and ensure a poetic flow of information before they started the blackout process. Of course, the anticipation in eliminating everything else was the fun part. It was an excellent way for them to engage with the text, understand the content, and have a blast doing it. Austin Kleon - Taking A Peek Inside "The Invention Machine"
The expanded availability of easy tech tools has empowered educators to rethink homework and daily instruction. Flipping the classroom with teacher-made videos allows students to self-direct their at-home learning. Many of these clips, however, still involve a one-day delivery of information, from teacher to student. Another approach is to allow children to make their own educational videos. They can enlighten their classmates with their creations, and they can teach themselves the material and the skills during the process of production. Symbol and visual metaphor - Students must choose images and icons to pair with their explanations, which fosters an understanding of figurative meaning. Narration - They must unite each visual frame with a seamless spoken narrative, to relate the core information via a smooth story. 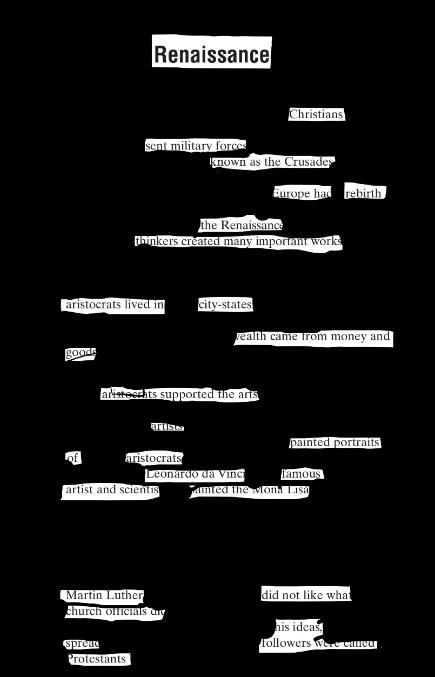 Text - Children must select crisp words to highlight vocabulary and terms, while avoiding large paragraphs and irrelevant language. Design - As filmmakers, they must combine colors, music, transitions, and layout, to assemble a compelling video that clearly conveys the content. Our eighth-graders made videos for their final exam review. It proved to be a perfect way for the students to teach each other. It took only one class period to create the clips, and now they can be embedded and shared for review at home. The kids have been watching them on their phones and tweeting them with a shared hashtag for online archival. Here is the page featuring all of their videos. Adobe Voice may be the app we've been waiting for. This effortless video creator may finally fulfill the promise of tablet computing. With a simple, intuitive interface and clean, effective visuals, the Adobe Voice app allows anyone to design animated videos in minutes. It finally turns the iPad into a seamless device for content creation, not just content display or interaction. We made the video above, entitled "Why Writers Write," in only 15 minutes. We actually made it just to experiment with the themes, music, and symbols, and we now see even more potential for producing instructional clips or flipping our lessons. This week, we're even going to turn the app over to our students and let them design videos to review together for final exams. David Pogue at Yahoo! Tech has a terrific write-up all about the possibilities for using Adobe Voice in making explainer videos. 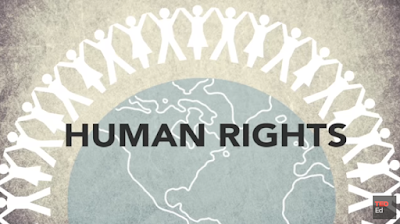 Sometimes called motion graphics or video infographics, these short animations combine icons and text to communicate a message. Often employed for online marketing purposes, explainer videos are perfect for the classroom. 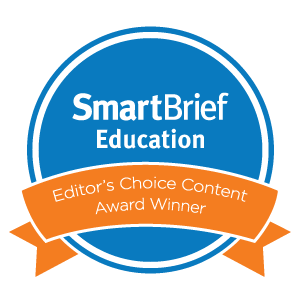 They blend voice, image, and language into compelling presentations for students to learn. For more information about the definition of explainer videos, check out the clips below from Column Five and Plainly Simple Studios. As Column Five notes, motion graphics like these achieve the "dual channel hypothesis," in which the brain receives information through both the eyes and ears. Learning tools that can tap into both modalities have greater effectiveness in fostering understanding. Pogue's piece in Yahoo! Tech outlines all of the easy steps in choosing a layout, selecting a template, adding icons, pictures, or text, choosing music, and then publishing. The app automatically searches images from the public domain, and it even generates a credits page at the end. The app's tutorial can lead any user, teacher or student through the painless and exhilarating process. 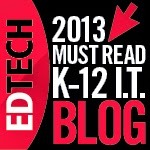 With such a quick and open-ended interface, the capabilities for Adobe Voice in the classroom are incalculable. Young entrepreneurs can plan advertisements. 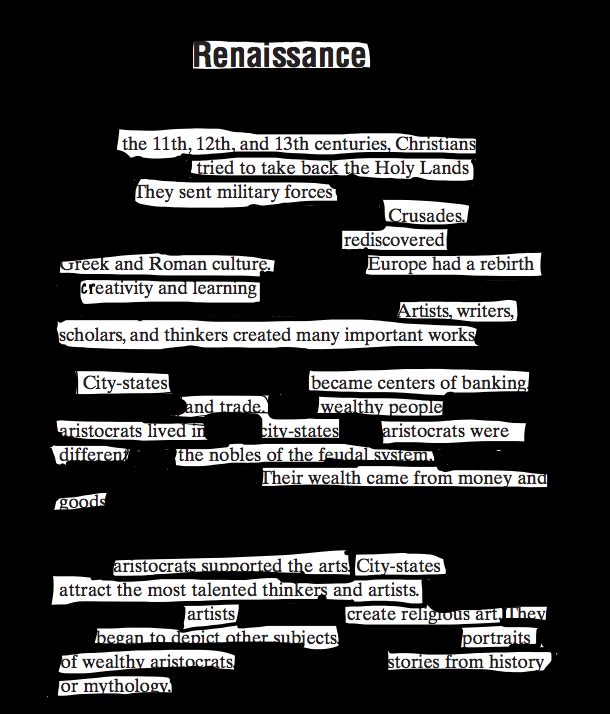 History students can make multi-sensory travelogues. English learners can design book trailers. Scientists can explain chemical processes. Foreign language students can demonstrate spoken understanding with written text and oral comprehension. Every video is linkable, sharable, or embeddable on any platform. 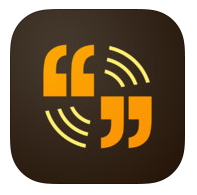 Best of all, Adobe Voice is free. We came across this fascinating animation of the evolution of London over its 2000-year-old history from the Guardian. It was created by the researchers at the University College London's Centre for Advanced Spatial Analysis (CASA). They used georeferenced road network data to show how it changed from a small Roman city to the metropolis it is today. Learners will be mesmerized watching the timeline unfold as it travels through time. 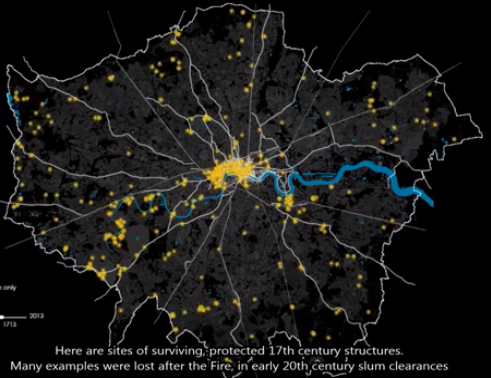 The short subtitles provide a historical overview of the different periods in London's long history, and the yellow, hot spots indicate where buildings and structures were built during each era. The London Evolution Animation is geography in motion that's bound to captivate and hold the attention of students as the visualization unfurls to soft, poetic music. We have been studying World War II recently with our middle schoolers, and in the past two days, we've focused on the horrors of the Holocaust. It was especially shocking, therefore, to read the just-released report from the Anti-Defamation League (ADL). 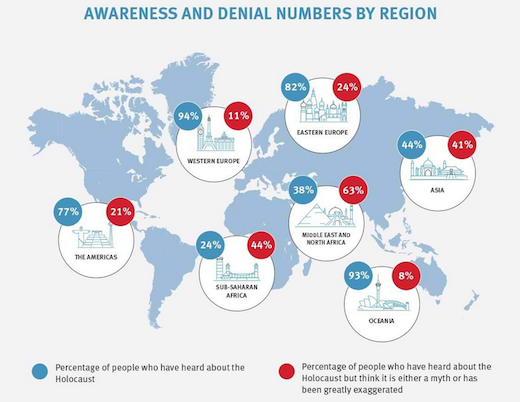 NBC News and other media outlets have reported on the startling "ADL Global 100" survey results that seek to gauge anti-Semitic attitudes across 101 countries and territories. 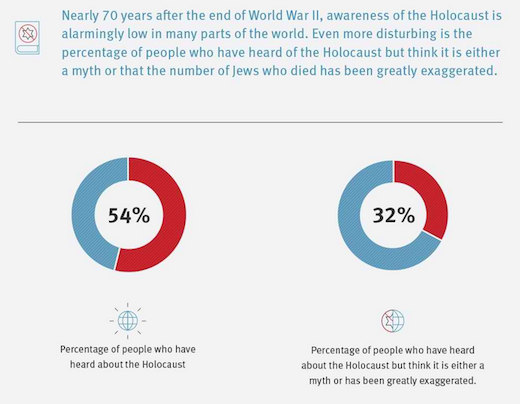 The survey data reveal that only 54 percent of people have "heard about the Holocaust," and 32 percent of those respondents believe the Holocaust is either "a myth or has been greatly exaggerated." 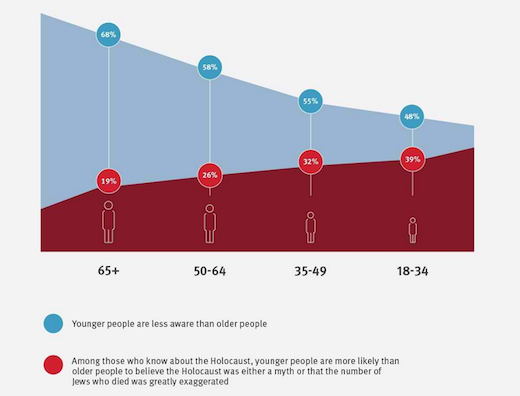 In addition, young people worldwide are significantly less likely than older residents to be aware of the true events. Not surprisingly, the results also vary considerably by geographic region. The ADL website has assembled its figures into easy-to-read infographics and visual interactives. 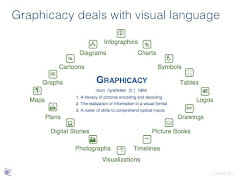 These charts, graphs, and maps make for helpful teaching tools with students. They also reinforce the effectiveness of data visualizations in clarifying information for a range of audiences. Statistics like these emphasize more than ever the need for authentic, non-propagandized education in global classrooms. Open access to the Internet and genuine historical records must be made available to pockets of students trapped under the influence of deniers. Survey results like these are also the reasons kidnapped school girls in Nigeria must be returned to their classrooms. They are the reasons Western involvement in Syria and Ukraine must be judiciously considered. They are the reasons students today must stand up in the face of hallway and cyber bullying. Ironically, it was on this day in history, May 14, 1948, when the State of Israel was proclaimed by David Ben-Gurion in Tel Aviv. Our third graders showed their aptitude in creating these wonderful infographics during their library class. They gathered the facts for their social studies unit on Brazil using the kids edition of ProQuest's online database CultureGrams. It did not take much class time either; as a matter of fact, it was completed in two classes. To simplify the components of infographics, we used words, pictures, and numbers to explain the different parts they needed to include to make them. As part of the lesson, we also explained the concepts of design, such as color choice, contrast, font selection, and balance. Knowing full well that kids tend to overuse every possible option in the toolkit, we spent some time instructing them to choose backgrounds that complemented their information to enhance the overall layout. This included color patterns and selection of photographs. From there, they went to town using PicCollage on their tablets to create their visual designs. Giving context to content in this way was not only an engaging way to learn, but it also provided a venue for personal choice to show their understanding.